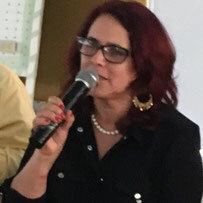 María Dolores Guadarrama Orozco (Mexico/ France) is a mexican writer. She was born in the North of Mexico late in the fifties and spent her childhood between the dry wind of the Northwestern Chihuahua, the rigors of the sun and the Rarámuri cold, with the fierce solitude of the canyons, the harsh coarseness of the land. She has published books of poems, written poems. Her life is a perpetual decree of will and dream and love of flying high. She is presently living and working in France. in front of me, passionate. trastabillando entre las ramas del manzano. sobre la yerba del paisaje.